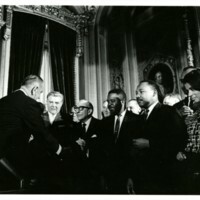 Claude Pepper shaking hands with President Johnson after the signing of the Voting Rights Act as Ralph Abernathy and Martin Luther King, Jr. look on. 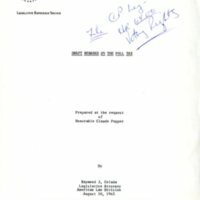 A copy of the remarks made by Congressman Claude Pepper on the Voting Rights Act of 1965. 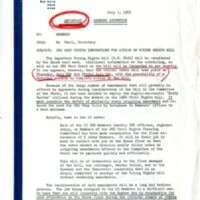 A news release from Mo Udall to all members of the House of Representatives detailing crucial voting days leading up to the passage of the Voting Rights Act. 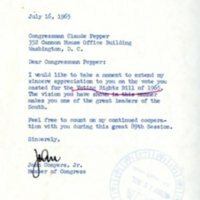 A letter from freshman Congressman John Conyers congratulating Claude Pepper for his support of the Voting Rights Act. 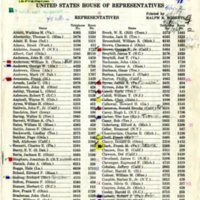 On this temporary Congressional phone directory, Congressman Claude Pepper kept track of which of his colleagues could be counted on to support his amendment to the Social Security Act of 1965.